We have an enemy arrayed against us that is ancient and ruthless in his hatred toward us. He has been around for eons. He was an angel that served at the very throne of God. But the story goes that he fell from that place of power and has become the enemy of God. He has no power to do anything against God so he comes to destroy God’s children. But we know we have a mighty victor over all the authority and power of Satan – Jesus! In Christ we have been given authority over this fallen angel known as Satan or Lucifer. So we need to understand the depths of that authority and how to wield it properly to get the results we need to keep the devil under our feet. Eze 28:16 AMP Through the abundance of your commerce you were filled with lawlessness and violence, and you sinned; therefore I cast you out as a profane thing from the mountain of God and the guardian cherub drove you out from the midst of the stones of fire. Satan was cast out of Heaven from his place of authority and service as an angel at the throne of God. He was ejected from the zoe life of God. Luk 10:17-18 AMP The seventy returned with joy, saying, Lord, even the demons are subject to us in Your name! (18) And He said to them, I saw Satan falling like a lightning [flash] from heaven. Job 1:6 ESV Now there was a day when the sons of God came to present themselves before the LORD, and Satan also came among them. Joh 17:1, 2 These words spake Jesus, and lifted up his eyes to heaven, and said, Father, the hour is come; glorify thy Son, that thy Son also may glorify thee: As thou hast given him power over all flesh, that he should give eternal life to as many as thou hast given him. Jesus introduced a new species on the earth that has authority over Satan. WE are new creatures in Christ Jesus (II Cor 5:17)! We are a whole new creation that has authority over the devil! The devil is still the god of this world (I Cor 4:4) but we are not of this world (Joh 15:19). We now have back the authority over the earth and its resources that Adam lost. We now are under the second Adam so we are no longer subject to the devil; he is no longer our lord and no longer our father! We represent the highest power on the earth. Satan has no right to stand before the Father God in Heaven because the highest ruler of the earth is now before the Father God and He is Jesus! 1Pe 3:21-22 The like figure whereunto even baptism doth also now save us (not the putting away of the filth of the flesh, but the answer of a good conscience toward God,) by the resurrection of Jesus Christ: Who is gone into heaven, and is on the right hand of God; angels and authorities and powers being made subject unto him. We have back the authority Adam lost and but there are still people on the earth that allow Satan to be their lord and father. They still have the right to let Satan dominate them and they do so either out of ignorance or intentionally. So we see now that there are two powers in the earth: the people of Jesus and the people of Satan. We inhabitants of Earth decide who is ruling in the heavens directly above the earth in the spirit world (not God ‘s throne) known as Second Heaven. We Christians have the ability to let Jesus and His angels and servants rule while Satan’s people have the ability to allow Satan and his angels and servants rule. We each cast our vote by our words and actions. Satan is this world ‘s god but not ours. We are seated in Heavenly places in Christ. When Jesus was given all power in Heaven and earth we were too and we can kick the devil out of the heavens above us! The “god of this world” does not mean Satan is the head honcho over the earth like he used to be. It could be said better this way: he is this world ‘s god or the god of the people of this world. He is not our god and we are in the world; we represent the highest authority on the earth because Satan is under our feet. Satan is no longer in the Third Heaven accusing man before God the Father. Satan has been permanently cast out of the Third Heaven and we have overcome him by the Word of our testimony and by the blood of the Lamb! Satan, the Prince of the Power of the Air, has lost authority over all the earth and now he works “in “ the sinners of this world making them give him authority in their lives and in the Earth through the power of suggestion and sin. Satan only has the authority people give him. So it is possible for Satan to have absolutely no power here if people would stop giving him authority. There would be no stealing, killing, and destruction like hurricanes, tsunamis, and tornados if people would stop sinning and stop speaking things that disagree with the Word of God. We could have complete peace in our homes and lives if we lived in a bubble where sinners and their decisions did not affect us. But we live in a real world where the decisions of sinners do affect us. That is when we fight not with carnal weapons but in the spirit realm with the Word of God empowering the angels to fight on our behalf. We fight by no longer subjecting ourselves to Satan and his minions by not sinning. We fight by voting on who will stand in office representing us which decides who will stand in the heavens above us! Read Eph 6:10-18 and 2 Cor 10:3, 4. Php 2:8-11 ESV And being found in human form, he humbled himself by becoming obedient to the point of death, even death on a cross. 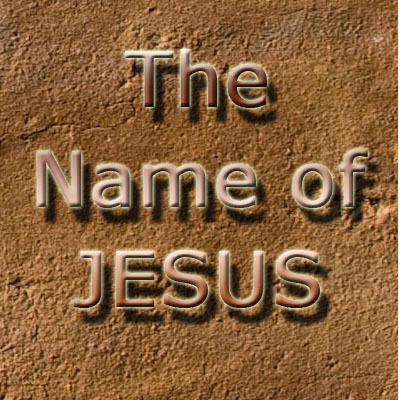 (9) Therefore God has highly exalted him and bestowed on him the name that is above every name, (10) so that at the name of Jesus every knee should bow, in heaven and on earth and under the earth, (11) and every tongue confess that Jesus Christ is Lord, to the glory of God the Father. Joh 14:13-14 KJVR And whatsoever ye shall ask in my name, that will I do, that the Father may be glorified in the Son. (14) If ye shall ask any thing in my name, I will do it. Joh 16:23-24 KJVR And in that day ye shall ask me nothing. Verily, verily, I say unto you, Whatsoever ye shall ask the Father in my name, he will give it you. (24) Hitherto have ye asked nothing in my name: ask, and ye shall receive, that your joy may be full. Now that have the authority over the devil in Jesus’ name what are we to do with it? We are to destroy the works of the devil just like Jesus did! Adam lost authority but Jesus gave us back authority that Adam lost in His name for Jesus is the second Adam. Now we have to power to undo what the devil has done. All things are to be subject to Jesus yet all things are not. Why? Because He told us to do it and we have not. We pray, “God get the devil off my back. Don ‘t let him harm me or my children. ” But God never said He would do anything about the devil now because he already did it in the past. The devil has already been defeated. Now, WE must do something about the devil (Matt 28:18-20; Mrk 16:15-18 ). We must use the name of Jesus to put the devil under our feet. We must tear down the strong-holds that the devil has by praying out the will of God in the earth. 1Pe 5:8-9 Be sober, be vigilant; because your adversary the devil, as a roaring lion, walketh about, seeking whom he may devour: Whom resist steadfast in the faith, knowing that the same afflictions are accomplished in your brethren that are in the world. Adam should have kicked that serpent out of the garden because he had the authority. We now have the opportunity to do just that in our lives. Kick that serpent out this time instead of listening to him when he tempts you! We have authority over the devil. The devil has no right to make you sick any more. When he tries, resist him; if you have sinned, repent and God will forgive and cleanse you then resist Satan. Do not give him a place to grasp you. Resist him in Jesus name and he has to go!